The Razer Thresher line is known for its quality craftsmanship as well as sublime audio, so how does the wireless Xbox version stack up? When the latest version of the Razer Thresher arrived at my desk I was extremely excited to try it out. I had previously given the Razer Kraken a go and I was neither here nor there… With the arrival of the Thresher I could give the wireless mid- to premium level headset a proper go. With this iteration of Thresher for Xbox being the first to make use of the Xbox Wireless protocol. This means that the Razer Thresher connects directly to your Xbox console. No dongles, no wires, no mess! Lets get into it! From the moment you open the box of the Razer Thresher you realize that you have a quality piece of hardware. packaging is sublime and I couldn’t wait to pull the Thresher out of its molded foam housing. It has similar design queues as the Thresher ultimate and the Thresher 7.1 but just cuts out some of the expensive bells and whistles to bring it in at around R1 700 give or take a few which is a very good price range to be in considering that its only big name wireless competitor is the Turtle Beach Stealth 600. I have now been using the Razer Thresher for more than a week and it is easily one of the most comfortable headsets I have ever used. Razer is known for their top quality materials and the Thresher doesn’t stray from that. The headstrap is made from light but sturdy metal while it features a floating headband which adjusts to fit most head sizes comfortably. The earcups are covered with thick high quality memory foam that allows for a surprising amount of breathing considering the leatherette-type covering. Earcups are also rather deep and roomy making for a comfortable space for normal ear sizes. One of the positives, but also part of the negative of this headset is the superb isolation effect the earcups offer. Blocking out most of the surrounding sound meaning you hear only what you need to hear and nothing else…including your own voice, but more on that later. Sticking with the slick design of Razer, the Thresher as a completely retractable mic for when you are not in the need of communications. 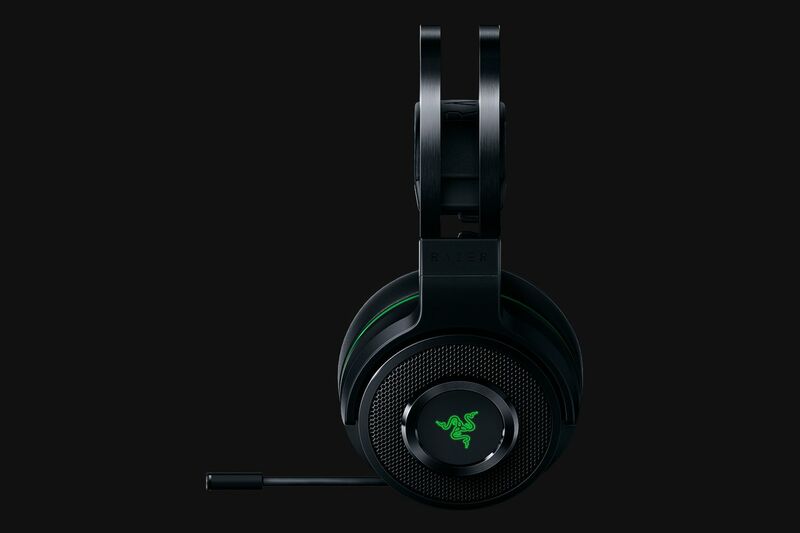 There are Razer logos on the outside of both earcups which light up (in green of course) when connected and ready for use, or flash when being connected or ready to connect to your Xbox One console. The PS4 variant naturally has blue logos. All controls, power-on/off, volume, mixer and mute are all neatly tucked away at the bottom of the earcups allowing for easy to reach controls. With a simple press of the respective wheels you can either mute the volume through the headset entirely or mute your microphone which will be signaled by a nifty reg light at the end of the retractable mic. The Razer Thresher really delivers when it comes to sound. The Kraken, the Threshers baby brother, left me rather underwhelmed by the volume as well as the clarity and destinctive-ness of different sounds. This is not the case with the Thresher. It delivers deep and thumping bass notes considering it is a wireless headset. Personally I always find that wired headsets seem to have a deeper bass note to wireless, whether this is true or whether its just my ears playing tricks I do not know. Mids are clear and even at low or high volumes the sound ranges don’t bleed between each other meaning you get clear sound no matter the volume. Voices don’t get drowned out by thumping bass or screeching highs. Where the Threshers really shone was when it came to party chat. No headset I have ever used has made a party chat sound this good! Mic doesn’t pick up unnecessary noise making that noisy chips that you are eating less of a irritation for your fellow party members. Overall there is not much wrong with this headset and you have to go really far to find one. The only problem I did have, and I did allude to it earlier in my review is the lack of Mic monitoring. For those who don’t quite know what Mic Monitoring is the simple explanation is that mic monitoring simply takes what your microphone picks up and plays it back through your headset so you can hear what you are shouting to your team mates. Many people might think this isn’t much of a hassle, and you would mostly be right. But the Thresher does such a great job of sound isolation that without mic monitoring I have had my wife come into the room asking me to keep my voice down on many late night sessions. Another small disappointment is the lack of virtual 7.1, even though I am not a big fan of it, its a feature that many people love and the lack of these 2 features really makes the Turtle Beach Stealth 600 and the slightly more expensive Stealth 700 become a viable alternative. 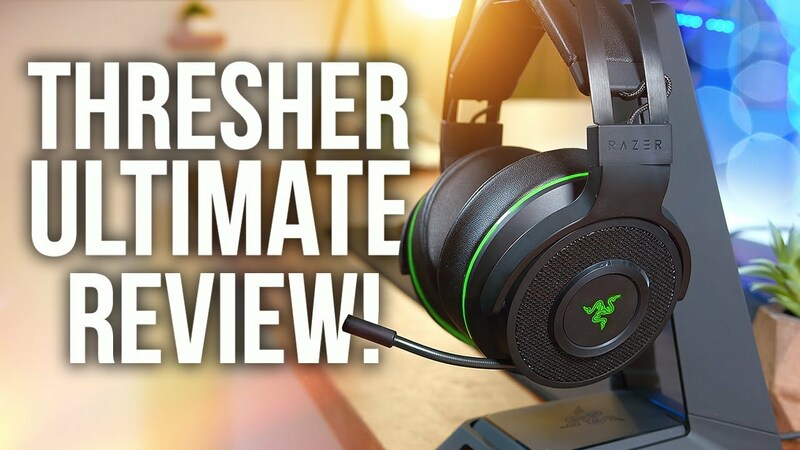 The Razer Thresher could easily be in my favorite wireless headset in this price range but with the lack of virtual 7.1 and mic monitoring it moves into my top 3! If those features don’t mean much to you and you are looking for a great sound landscape with unrivaled comfort and ascetic appeal, then the Thresher is a must have headset! As always a very special thanks to Apex Interactive for generously providing this headset for review as well as making it available to become a prize of a lucky Early Axes member!